There are a lot of misconceptions about Venus Flytraps out there, and they aren’t always harmless, often leading to the demise of these wonderful plants. We’re here to debunk them, after years of experience, experiments, research, and testing, so you can raise the healthiest Flytraps possible. Myth #1 – Venus Flytraps are “swamp” plants, and need to be immersed in lots of water at all times. This is absolutely FALSE and probably is the number one reason well-meaning people kill their Flytraps. 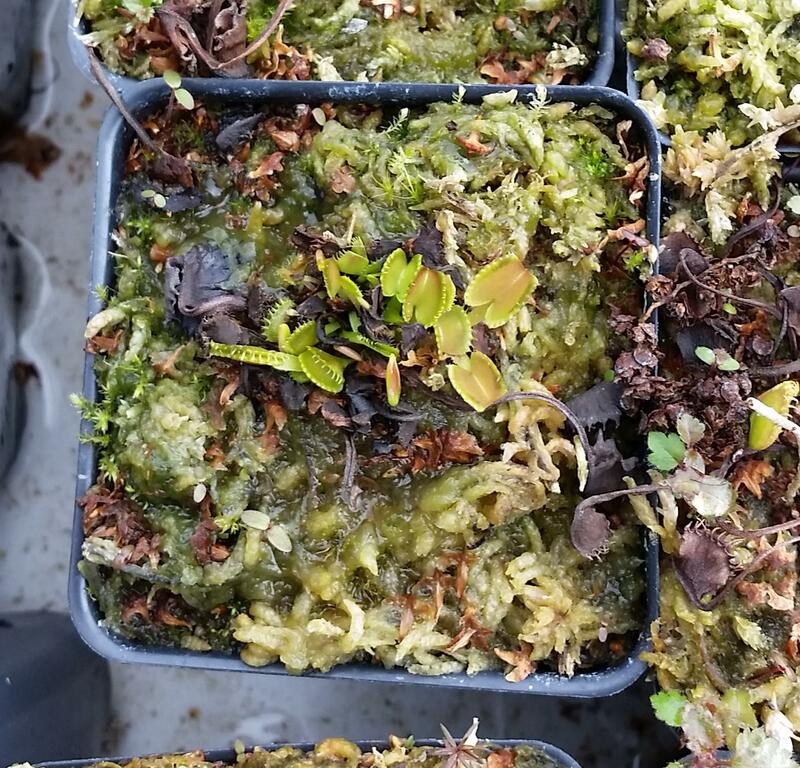 Venus Flytraps are actually from pine savannahs in North Carolina, where the soil is well-drained on top, but the roots have access to a water table down below if they want to take a dip. In other words, Venus Flytraps like having access to water, but they DO NOT do well in swamp-like conditions, completely swamped with water and humidity. As a matter of fact, Flytraps do the very best if you water them, allow their soil to get to being close to dry, but NEVER fully dry, and then re-water them. Their roots grow longer, their foliage is stronger and thicker, and they thrive. Venus Flytraps that are in a lot of water will rot very easily, and can get diseased more easily. We’ve seen it time and time again, over and over again. 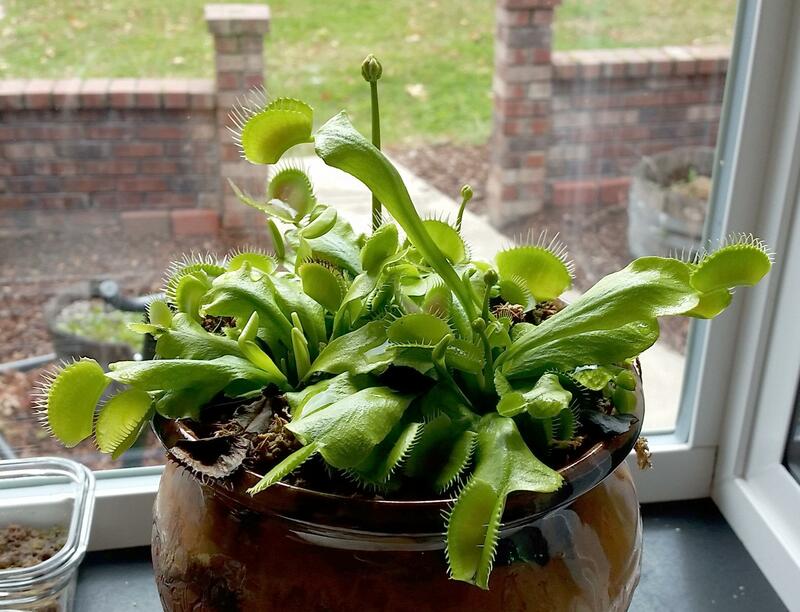 Folks really don’t want to let go of this myth, and insist that their Flytraps are doing well in lots of water, but when we see photos, the Flytraps are greatly struggling and do not look healthy. So, just to confirm again, Venus Flytraps do not want to ever be completely dry, but they are not swamp plants, and they do NOT DO WELL if constantly immersed in water. The only exception to this would be if you live in a place that is very hot and very dry. In that case you might need to give your Flytraps(s) lots of water, but you still don’t want them sopping wet. PRO TIP: Often, a slimy green algae type of substance will grow on top if they’re getting too much water, which is a helpful clue to take the watering down a notch or more. Myth #2 – Venus Flytraps must be fed bugs or they will die. Also, it’s OK to feed Venus Flytraps human food, like hamburger meat. Again, this is definitely false. Venus Flytraps can make food from the sunshine, with chlorophyll. They do enjoy a bug once in a while, and it does help them to grow, but they can do fine without bugs/feeding. Also, each trap can generally digest 4 or so bugs, and then the trap will expire and a new one will come up. So, if you’re feeding them and the trap turns black and dies after a bit, that’s normal. As for hamburger meat and human food, that’s an absolute no-no for Flytraps. They can act like our human buddies sometimes, moving independently as they do, seemingly smiling up at us, but they need Venus Flytrap food, which is sunshine and pretty much any bug that can fit in the trap. So please, don’t feed your Flytraps human food (unless you eat bugs, which…okay), and don’t panic if you can’t find bugs for them – they don’t need them, they just like them, like humans with dessert. PRO TIP: As a side note, hard-shelled bugs can tend to cause traps to turn black, but don’t seem to bother the plant as a whole. Myth #3 – Venus Flytraps need to be in terrariums, and need humidity. This myth is very prevalent, and we’re guessing it came from unfortunate growing kits that used to be sold including domes. However, Venus Flytraps actually do very poorly in terrariums, and will often die. This is because the high humidity doesn’t allow the growing medium to dry out very well (you never want it totally dry, but you also don’t want the growing medium sopping wet all the time – see Myth #1). Also, in a terrarium there isn’t much air movement, which allows fungus, mold, and bacteria to stay on the Venus Flytrap, which can often lead to its sickness and demise. Venus Flytraps need fresh air and fresh air movement. Venus Flytraps NEED TO BE OUTSIDE, as long as it’s not freezing conditions, or so hot that the roots can burn (generally this is over 95F or so, depending on the insulation ability of your pot and growing medium). Another problem with terrariums is that if they are indoors then people are generally using artificial lighting, which can provide some UV light for Venus Flytraps, but is just simply not enough for a thriving plant. We can always tell when a Venus Flytrap is not getting enough light. It is very obvious, as the plant has long thinned-out or widened thinned-out foliage, is a paler green or is just all-green with no reddish or other coloration at all, and has sparse foliage with small or non-existent traps. Many people think that Venus Flytraps that look like that are doing well, but in fact they are not, and need actual outdoors UV light. Artificial lighting simply won’t cut it for Flytraps, as much as you want to keep your Flytrap indoors (we understand, we do, too, but it’s just not a good idea). A south-facing indoors window is your best bet if you MUST keep it indoors, but even then you will not have a thriving Flytrap, and you will see the symptoms listed above, with the thinned out weakened traps and leaves. Believe it or not, the Venus Flytrap in the above photo is in a south-facing garden window is not as healthy as it could be. Although it is not close to death, it is indeed sunlight-deficient. Notice the thinned out and flattened leaves, that are curling over. Even in a sunny window, Flytraps don’t get enough direct sunlight, because the window filters some of the UV rays. So Venus flytraps should be grown outdoors as much as possible. You can bring your Flytrap(s) indoors if it is freezing outside, and if it is too hot, you can place them in dappled light, or just keep them in the sunshine for the morning and early afternoon and put them in a more shaded situation for the late afternoon. 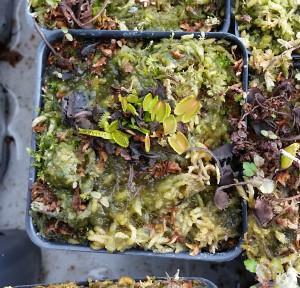 But please, put your Flytrap(s) outside – they’ll love you for it, we promise. PRO TIP: Venus Flytraps especially love an environment when there is moving sunshine and a bit of moving shade, such as under a pergola. Myth #4 – Venus Flytraps will hurt me / my kids / my pets. You should never poke the inside of a Flytrap’s traps, because it takes a ton of energy for it to reopen, and it gets no reward for closing (no food energy reward). That would be like if someone asked you to run for 5 miles and then promises you a cookie afterwards, but never gives you the cookie. But okay, let’s say your finger somehow did get snapped in a trap. Well, it’s pretty much going to feel like a feather, or eyelashes, definitely not a spring-loaded bear trap, and definitely not going to hurt you or your children or pets. Also, another related and less-fallen-for myth about Flytraps is based on the movie, “Little Shop of Horrors,” and is the incorrect belief that Venus Flytraps are ginormous. Venus Flytraps are actually quite small as plants go, maybe about 5″ tall in their older years. So, their small-ish but awesome traps definitely couldn’t hurt you. Just to clarify, *wink-wink, Venus Flytraps also don’t sing (although they do seem to communicate awesome vibes). So there they are, the most harmful myths and misconceptions about our beloved Venus Flytraps. Please be good to your Flytrap(s), put them outside so they can get good sunshine and air movement, give them mineral-free water (distilled water is easiest) but not in a swampy sopping wet manner, and feed them their “dessert” bugs but don’t worry if you can’t. Venus Flytraps are the coolest little creatures, and we want you to keep them as happy and healthy as they can be. Happy Flytrap growing!